Turning Colder This Afternoon - Windy. Cold Front Moves South Today. 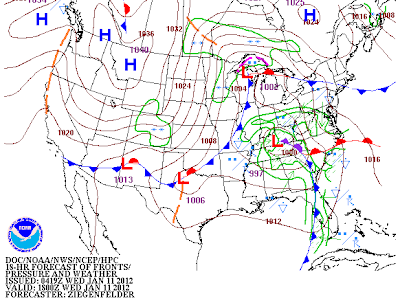 Surface Map Forecast At 11 AM MST Today. 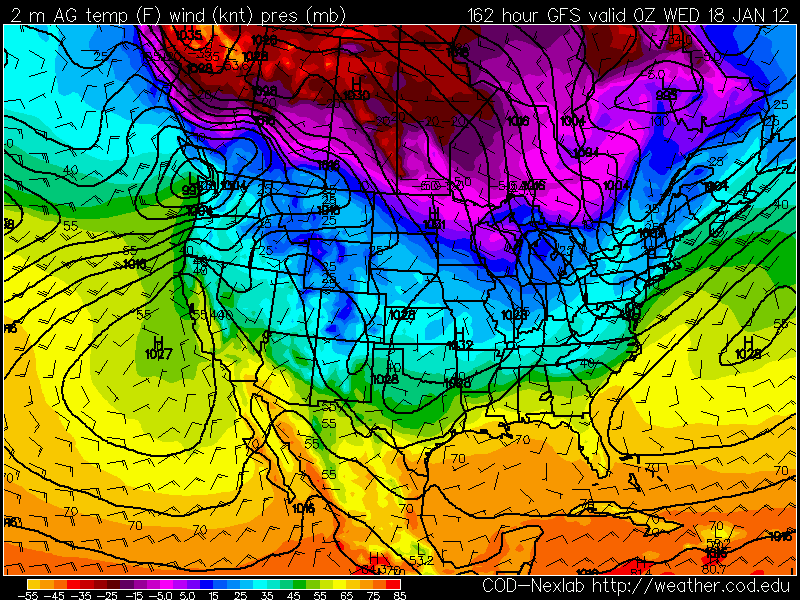 NAM-WRF 500 MB Forecast At 5 PM MST Today. 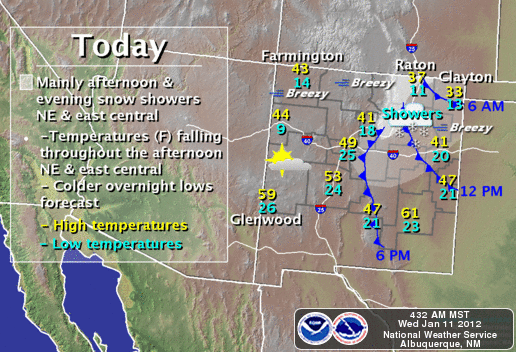 Most of southeastern New Mexico warmed up yesterday afternoon. High temperatures ranged from 64 at the Roswell Airport, to 62 here at my home in Carlsbad, 60 at the Carlsbad Airport, and 59 at the Artesia Airport. Hobbs had one of the coldest readings in the area with an afternoon high at the Airport of only 45 due to the snow cover. Even Cloudcroft managed to get up to 46, and the Smokey Bear Raws in Ruidoso was 53. A cold front will get kicked southward into southeastern New Mexico today as an upper-level disturbance passes by to our north. 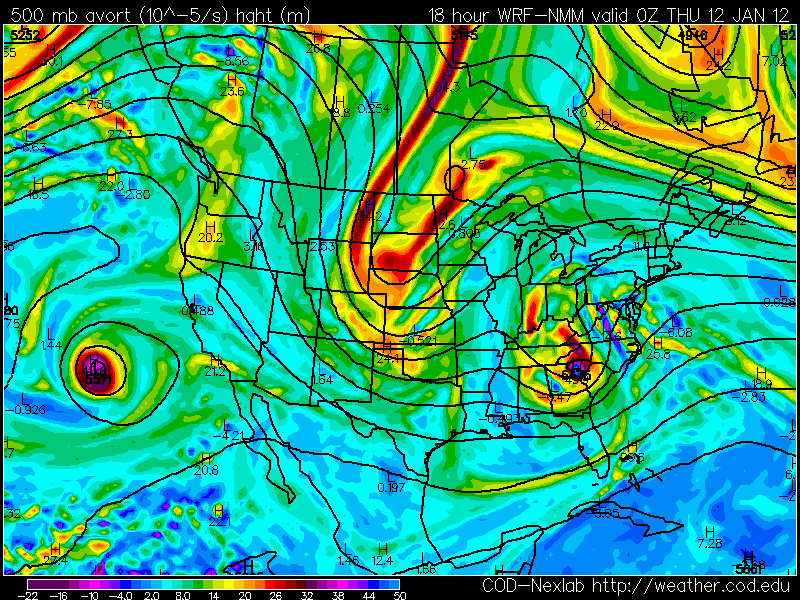 This disturbance is depicted above by the NAM-WRF 500 millibar/18,000' MSL forecast map. Our latest winter storm to hammer the area will be located over the southeastern US by sunset and continues to weaken as it moves east. Gusty northwesterly to northerly winds at around 20 - 30 mph will accompany the frontal passage this afternoon. Our afternoon high temperatures today will range from around 55 - 60. Colder air will overspread the area tonight into tomorrow. 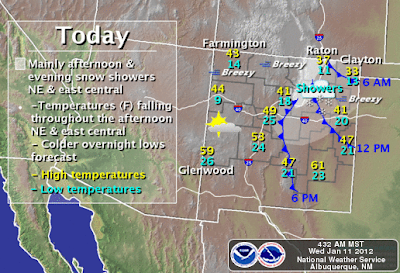 Most of southeastern New Mexico will dip down to near 20 for lows by sunrise tomorrow morning. Our afternoon highs are forecast to only be in the upper 30's to the mid 40's tomorrow. 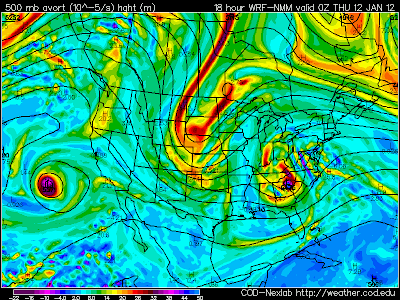 Flow Aloft Goes Zonal Next Week. 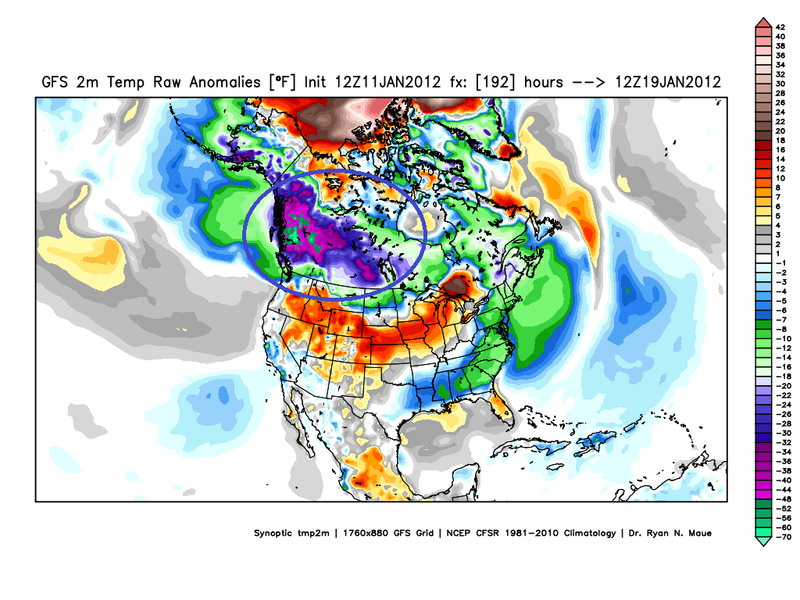 GFS 500 MB Forecast Map At 5 AM MST Mon Jan 16, 2012. Rather tranquil weather will prevail as we end the work week and head into the weekend. Our afternoon high temperatures on Friday will range from the upper 40's to the mid 50's. Saturday will see readings mostly in the mid-upper 50's, a few spots may get above 60. Sunday will be even warmer with highs in the low-upper 60's. Its possible that a few spots may flirt with the 70-degree reading by Sunday afternoon. A weak upper-level disturbance will zip across the state Monday but will produce little in the way of serious weather. 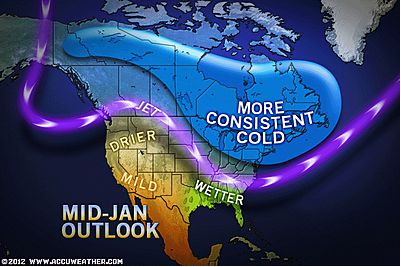 Map Is Courtesy Of AccuWeather. 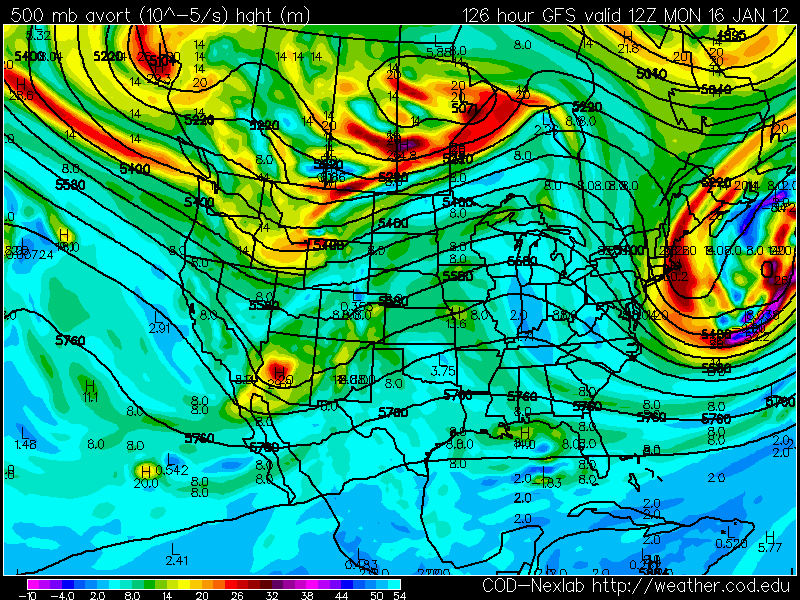 GFS/ECMWF 500 MB Mean Flow Next Week. 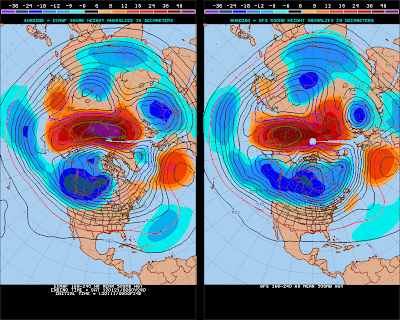 Long-range models indicate that a pattern change will develop later this week into next weekend. For the first time in six weeks, no significant winter storms are being forecast by the models to impact the state for the next week to ten days. Current medium and long-range model forecasts indicate that a rather flat zonal flow aloft will develop over most of the US. This will keep the storm track well north of New Mexico, and allow for warm and tranquil weather to dominate later this week into next week. After weeks of below normal temperatures and multiple snow storms, we will see a period of above normal temperatures and quiet weather for awhile. 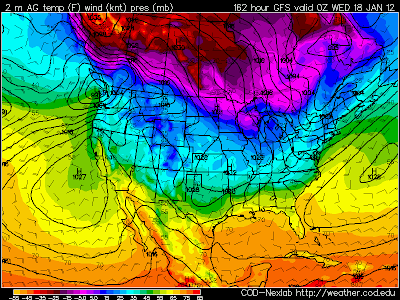 GFS Surface Temp Forecast At 5 PM MST Tue Jan 17, 2012. As long as the zonal flow aloft pattern holds, then we will not see the jet stream buckle, sending the storm track diving southward into the Desert Southwest like we have been experiencing over the past six weeks. 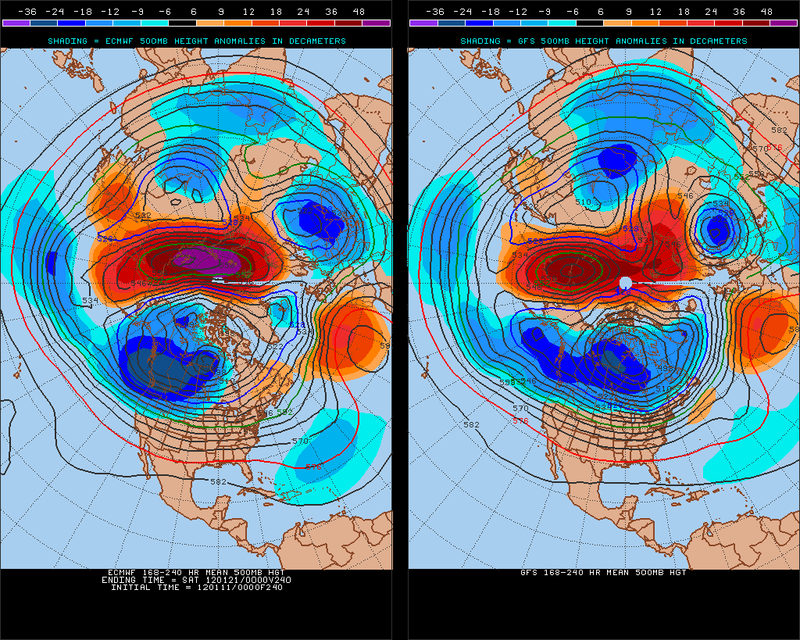 There has been a a lot of discussion since mid-December concerning this change in the upper-level pattern. Some forecasters and meteorologists think that a blocking pattern will develop, which would shift the Polar Vortex over northern Canada southward, thus allowing several surges of bitterly cold arctic air to come southward into the US. Others believe that is not going to happen. The jury is still out on this one. 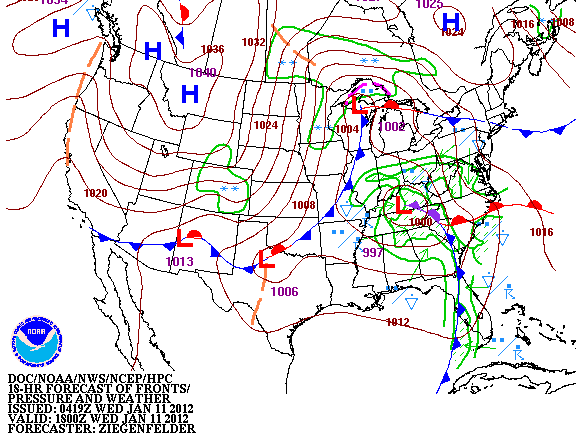 Take a look at the surface map forecast above for next Tuesday. 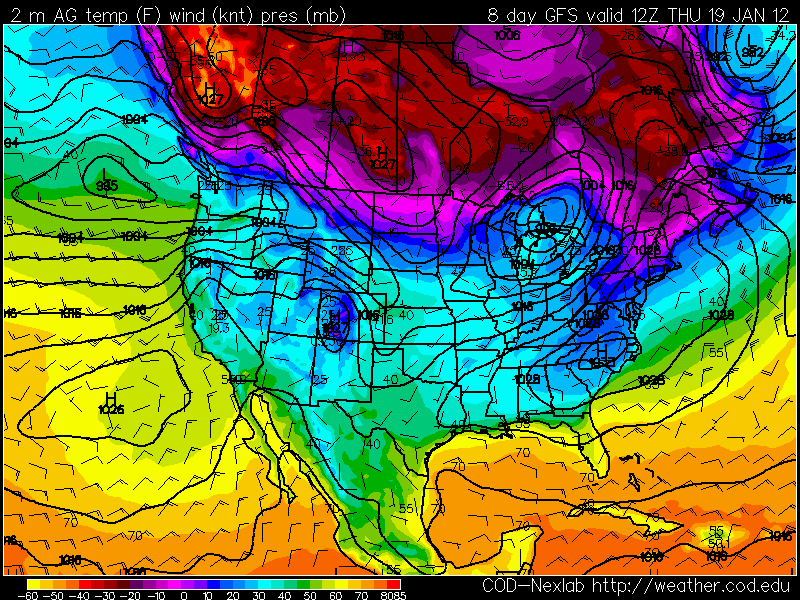 A massive dome of arctic air is forecast to cover much of the northern US border states with Canada. Temperatures across northwestern Canada are forecast to dive as low as -30F to -55F. As long as the flow aloft over North America stays more or less zonal, then this bitterly cold arctic airmass will remain locked up over Canada. 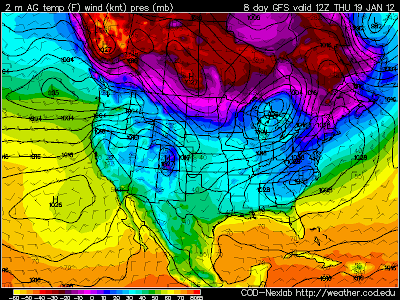 If the jet stream buckles next week, then look out, because this slug of very cold arctic air will come south. Maybe The GFS Is Picking Up On This? 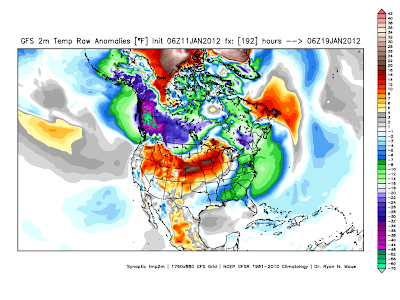 GFS Surface Temperature Anomalies Forecast. 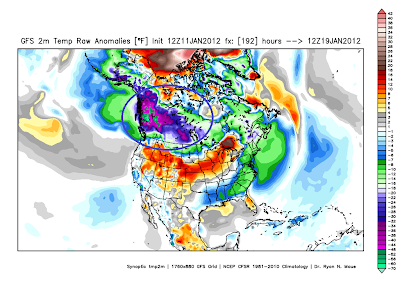 Valid At 11 PM MST Thu Jan 19, 2012. 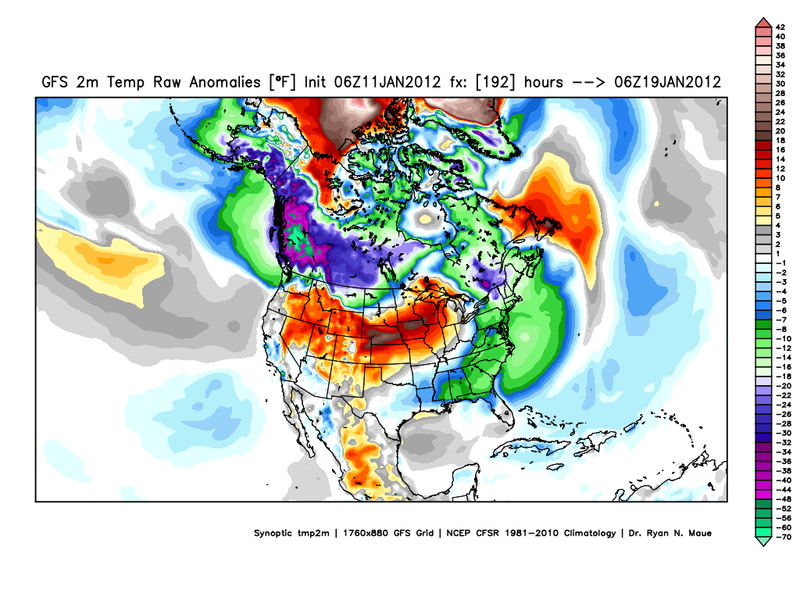 Valid At 5 AM MST Thu Jan 19, 2012. 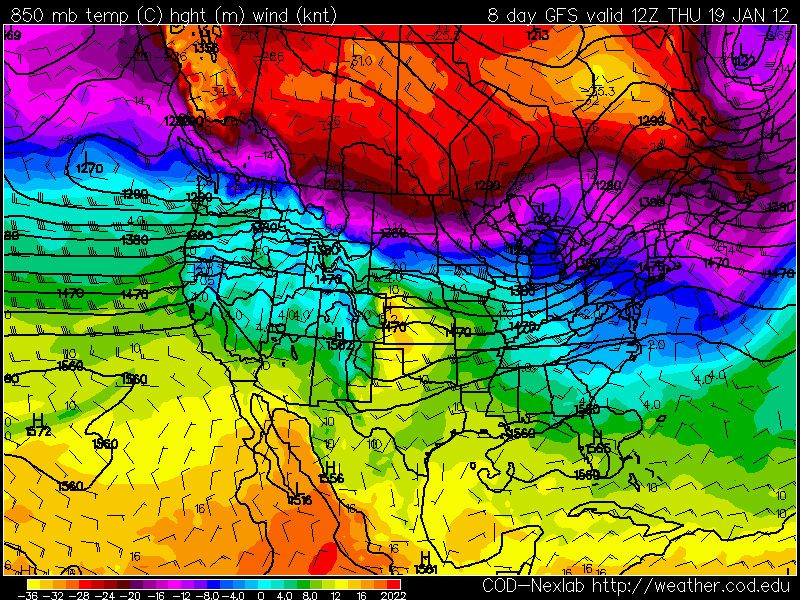 This Mornings GFS 850 MB Temp Forecast. I am a little skeptical of the model forecasts in the long-range. Its been a rather unusual winter, and I am not so sure that we are done with winter here in New Mexico just yet. I don't think that the models have a very good handle on the long-range outlooks, so don't be surprised to see some changes in the forecasts next week. Take a look at the maps above. If this is anywhere close to being correct...then somebody is going to have to deal with some incredibly cold weather, somewhere downstream of those temperature anomalies of -70F below normal over northwestern Canada in about a week. I added this mornings, GFS 12Z/5 AM MST temperature anomalie map, the 850 millibar temperature forecast map, and the surface temperature forecast map valid at 5 AM MST on Thursday, January 19, 2012. This mornings run of the GFS has temperatures across northwestern Canada tanking into the -50F to -60F range around the 19th. I realize this is a long ways off, and the models have performed poorly so far this winter....but that's an incredibly large mass of very cold air. It stretches all the way across Canada from the Pacific Ocean to the Atlantic Ocean. 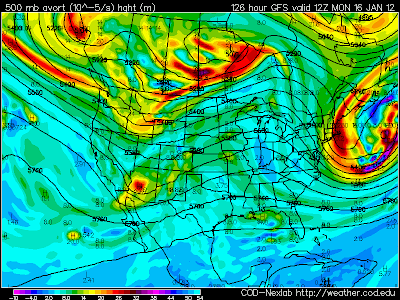 I think wed better watch this one and pray that the jet stream dose not buckle.